In terms of the total number of species seen in a single day , today has been the best of the year so far. Thirty four different birds, about ten short of our best ever single day total but still a decent number. We also recorded four species for the first time since they returned after the winter away , House and Sand martin , our breeding Sedge warblers are back and we heard the first Cuckoo. Also notable was recording seven species of the finch family in a day , Chaffinch, Greenfinch, Goldfinch, Bullfinch, Siskin, Linnet and Redpoll. Our female Canada goose is sitting tight on a nest of eggs with her mate patrolling the pond and surrounding area. There is a pair of Little Grebe, seemingly breeding again as well as at least a couple of pairs of Moorhen. Whilst it is nice to be able to see Otters, we are hoping not to get a visit to the pond as we did at this time last year which resulted in the decimation of all the water birds nests !!! Of course the lovely sunny weather has helped, please may it continue a while yet !! 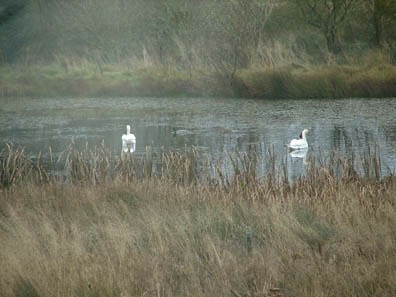 20 different species of birds today on or around the farm, so not bad for a January day. 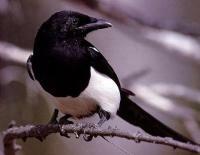 Interesting to record 4 members of the Corvid family ! 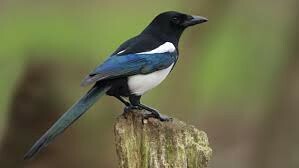 I mentioned Jays the other day , which we saw today also , but we now see Magpies just about every day, whereas they used to be a species seen here only rarely, the change brought about by the same reason, ie. 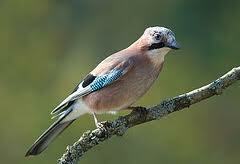 improved habitat, that I talked about in relation to the change in the Jay status for us. 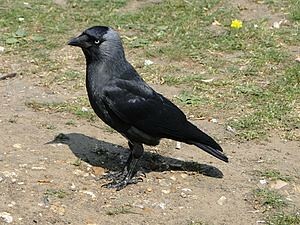 The third member of the crow family seen today is Carrion crow which has always featured regularly on our daily lists. 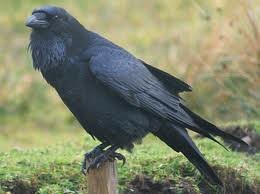 The fourth Corvid seen today is an altogether more impressive bird ! 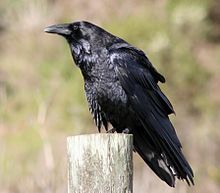 Ravens have been becoming steadily more commonly seen in this area for about the last 3 years, it is a pretty much nation wide phenomenon which is likely to be down to reduced persecution of this magnificent bird. I am fairly sure that a pair bred not far from Willowbog last year. 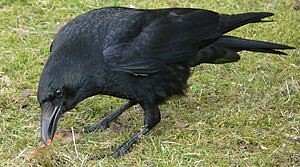 If we were a little further into the spring I might easily have noted 5 members of the family, adding jackdaw to the list. For some reason we hardly ever observe Jackdaws at ground or tree level on the farm but in the spring we regularly record an overhead movement of the species. Usually my attention is drawn to the generally small flocks as they pass over by the very distinctive call and it is one of my favourite bird sounds. Most of the usual suspects in and around Willowbog today despite a fairly drizzly, murky sort of day. All 4 species on the main pond, swans, mallard, moorhen and goldeneye. An interesting aspect of these daily records [ we are starting on our 21st. continuous year of recording the birds on and around the farm ] is the way that the different species can come and go, or not , as the case may be ! 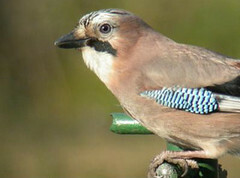 The bird in this photo [ which is not mine by the way ] the Jay, is a species that we really hardly ever saw here until less than a year ago. Now there are a couple, sometimes 3 that are becoming almost everyday birds on the list. My guess is that this will mainly be because the various tree and shrub plantings that we have done is reaching a degree of maturity which provides the sort of cover that this species requires, they are to be seen partaking of the fat-balls as well as peanuts. making an attempt to resurrect my wildlife blog and to use it in a more interesting way rather than just a daily list of birds. 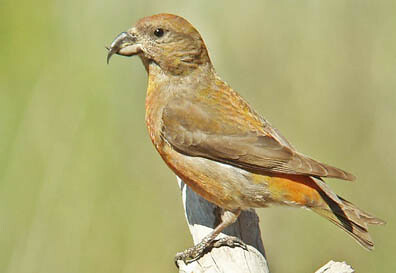 lots more crossbills about than are usually seen on the farm at this time of year , there is a huge cone crop in the sitka spruce surrounding us so this might have something to do with it. 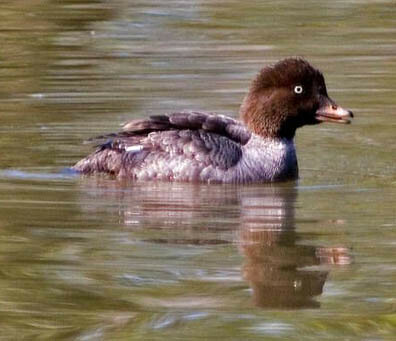 before the pond froze over a week or two back we had 4 goldeneye with us, now just a single female bird. keeping it company are this pair of mute swans and a hand-ful of mallard plus a moorhen or two. 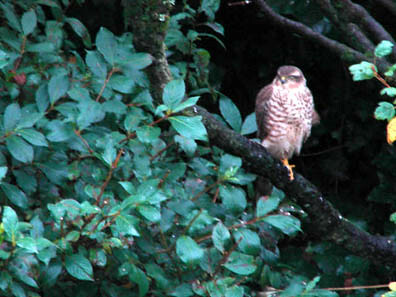 not this particular bird but a sparrowhawk has visited the garden a few times today sending all the little birds scattering , it seemed not to make a kill though !